It's said that in ancient times, this name used to mean "bear". A bear is the king of the forest. A huge and vicious beast. Few can withstand a strike from its paws. Was there anyone else in the past who smiled and thought that in the past? I see. You were indeed Arthur. Little girl, you are a king, a huge beast, and also a dragon who none can equal. Thus on the back of the famous steed rides a dragon. 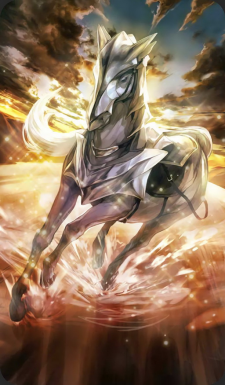 Behold, the steed neighs in excitement. King who was once a girl, give your order! This page was last modified on 4 April 2019, at 14:42.